Blue waters, green waters. Deep waters, shallow waters. 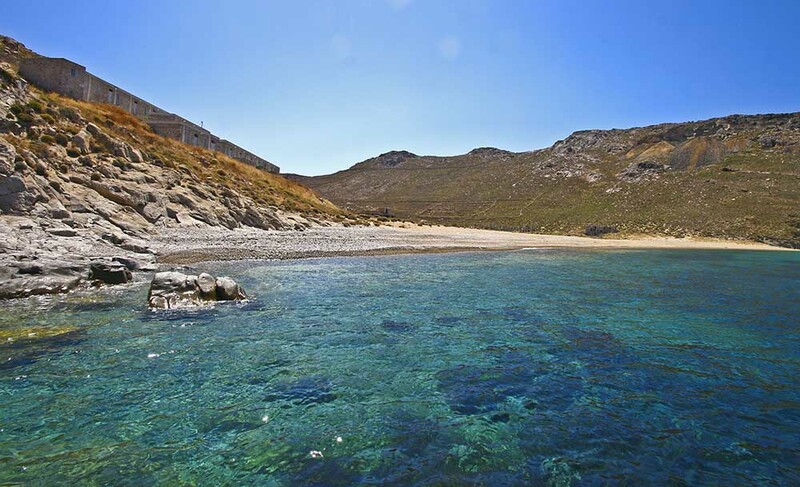 With plenty of shade, with some or no shade….with churches, with taverns, with bubbles, with sand…..In order to discover the 40, officially mapped beaches of Serifos (although the locals talk about 72! ), you will need to spend many summers in the island. Lia. One of the most beautiful beaches of the Island, with crystal clear waters which is favourite by the nudists and many celebrities. Bring your mask with you in order to look around at its lovely seabed and your umbrella for shade, as except from a few rocks there are no Tamarix trees. The island across the beach is called Vous. Avlomonas is located next to Livadi and it is the biggest beach of the island. Being 1.5 Klm long, with crystal clear waters and is accessible by car. Livadakia. 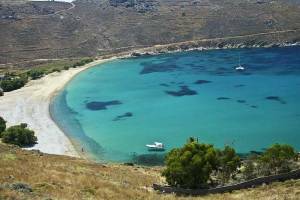 It is a small, sandy beach, with tamarix trees, located on the western side of the port. Most of the rooms to let in the Island are gathered over this area. Megalo Livadi. It has shallow and calm waters. It is ideal for families as there are not many cars around, while there are shady taverns next to the sea. Karavi. This beach combines flat rocks with golden sand. At the opening of the cove there is a reef that is being dangerous for the floatables, where its peak stops a few centimetres below the sea surface. 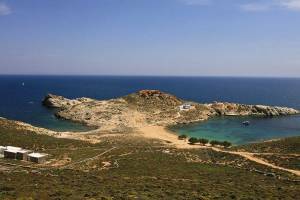 At this area, two shipwrecks have been discovered, at different time periods, both loaded with ancient amphorae. Koutalas (Spoon-shaped). It mast have been named after the shape of the bay that looks like a spoon. It has clear waters, an interesting seabed and an amazing ore loading ladder. The landscape refers to earlier decades. Ganema. It is a popular beach, with golden sand, tamarix trees and clear waters. While driving from Vagia, in case you do not have an off-road vehicle, you will need to park along with the others at the edge of the beach and walk your way down as much as you can withstand. Otherwise, you can continue for a few meters further. Before you reach the uphill, you shall turn left to the stream with the cobbles. This path leads near by the little tavern on the beach. Psili Ammos. 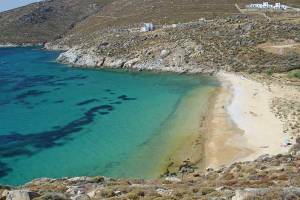 An award winning and beautiful beach with green shallow waters, golden sand and tamarix trees. There are two taverns there with parking lots. Agios Ioannis. 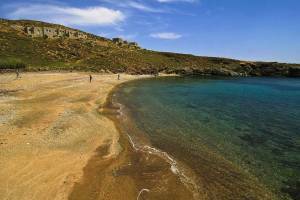 Twenty meters below the beautiful chapel, which is dating back to 1781, it is located the less cosmopolitan beach of the eastern side of the island. The beach has big tamarix trees, sand to its right side, fine pebbles in the middle and cobbles to its left. The wide steps make the descent easy. Platys Gialos. You can see the seaport of Taxiarches monastery from above. You shall turn at the junction and continue walking downhill the twisting and turning road. Despite its name, it is an enclosed bay with sand, nice and deep blue waters and it consists of three small beaches: Platys Gialos, Mesiano and Vorino (to reach the last one, you will need to walk). The chapel located at your right is dedicated to Agioi Apostoloi and it is built on the foundations of older churches. Sykamia. The beach has shallow and green waters, tamarix trees and is sandy. This is an impressive and long beach. It is quite possible that it took its name after the ‘sykaminies’ (mulberry trees) that used to exist during the Frankish rule – there had also been made efforts for silk production during that era. The strongest point of Sykamia is the family restaurant that is located there. With a 20 minutes walk, from the path that you shall see at the eastern side of Sykamia, you can get to the neighbouring and beautiful bay of Skala. The sheltering bay is ideal for mooring. It has a water well, fish houses and the beautiful country chapel of Agios Nikola (St. Nicholas). Agios Sostis. 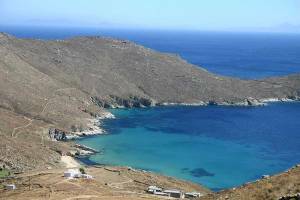 It has a very small peninsula that is connected to the rest of the island through a narrow strip of sand, creating another, even smaller beach. The opening to the south makes it ideal for relaxation during the etesian wind. The beach has tamarix trees, nice seabed, thick sand and great fans. In order not to disturb the tranquility of the landscape, leave your car at the top of the hill and go downhill the road (it takes 7 min). Kalogeros. Follow the path on the right side of Malliadiko and after trekking for about 20 minutes you will get to the beautiful Kalogeros beach. The threshing floor and the tall windswept palm tree, offer to the beach a special atmosphere. Karavas. 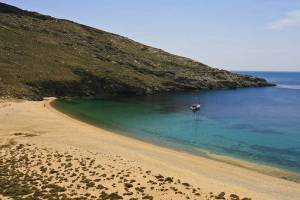 It is located on the north side of the island and it has sand and pebbles. You shall go downhill to the path that starts at the beautiful chapel of Agia Thekla and until the col of Kefala remains accessible, but afterwards it becomes indiscernible and requires caution. Kalo Ampeli. Green waters, sandy beach and wide rocks, no shadow at all. The path passes by the beautiful chapel of Sotiras and from there it remains visible up to the beach.